Enclosing the skeletonized full tang are two removable Ultramid handle scales. Ultramid is the brand name for a type of nylon thermoplastic that’s lightweight, comfortable to hold, and durable. KA-BAR and Becker make carrying this knife less of a chore by including a MOLLE compatible heavy-duty polyester sheath that can also fit a smaller Becker BK13 Remora for less demanding tasks. Because this is a collaboration with Becker Tool & Knife, the BK7 carries a dependability and workmanship you can bet your life on. If you need something that won’t let you down in high-stress situations, it’s hard to beat this heavy-duty USA-made fixed blade. 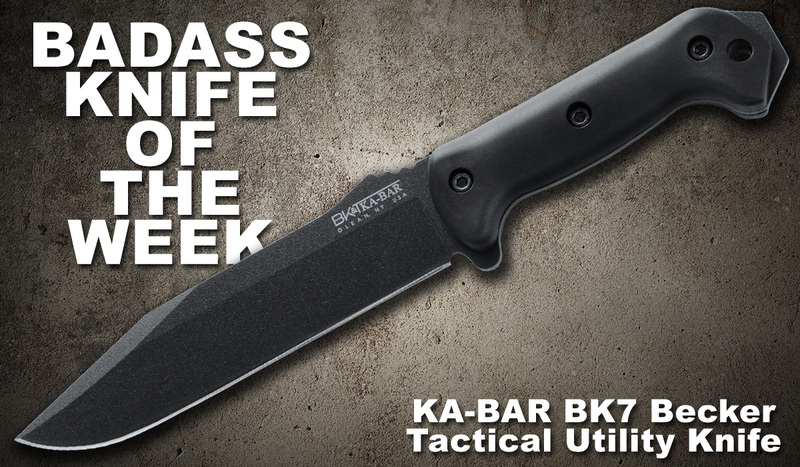 For more info on this Badass Knife of the Week, see the product page for the KA-BAR BK7 Becker Combat Utility Knife.